Metal braces are the most common. They are made of high grade stainless steel. Today’s braces are much smaller and more comfortable. 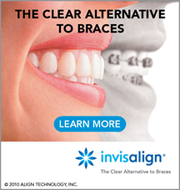 Most of our patients like to dress up their braces with different color elastics that are changed at each appointment. Multiple colors are available. The metal braces are the most durable and are good for our younger patients. Ceramic braces are a translucent tooth colored material. They are most popular with our adult and older teenage patients. They are much less noticeable but work just as well as the metal braces. Some patients like these braces to have the choice of having less noticeable braces one month, and/or wearing colors the next month. We use elastic ties that are tooth colored that blend in really nicely with teeth.